As a naturally fickle person, this past week I eschewed ink-stained fingers and instead explored the current state of portable digital drawing. On Wednesday I attended a life drawing session with an iPad and my Adonit Jot Touch. This isn’t the same pen that I was showing off last year, but an updated version that promised greater pressure sensitivity and a lower-power Bluetooth 4.0 connection. Much like the previous incarnation, I liked the pen in theory, but I found it a bit clunky for loose sketching, since I seemed to have to apply more pressure than I ever would to a pencil or a stick of charcoal, or even an ink pen. But a recent update of my favorite drawing app, Procreate, seems to have resolved that. I can now sketch with a very light touch. It made for a very fun figure drawing session; I got to experiment with all sorts of virtual media, keep my hands clean, and even see video playback of my drawing. Very cool. Proving I have a gadget problem, this week I also happened to purchase a used Samsung Galaxy Note II. No, I haven’t abandoned Apple; in fact, I purposely haunted eBay for a deal on this “phone,” since I knew I only intended to use it as a pocket sketchpad and not an iPhone replacement. Oh sure, there was the chance I’d end up loving it for more than just the pen, but my opinion of the Android operating system remains the same as when I tried out the larger Galaxy Note tablet. Unintuitive and clunky are the operative words. There’s also kind of a surprising dearth of decent drawing programs, even compared to the iPhone, which is almost impossible to draw on. 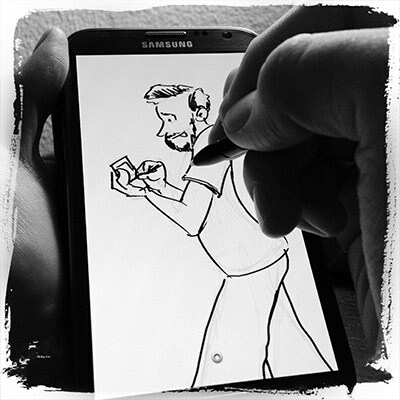 After trying out several Android apps, I found the only decent one to be Sketchbook Mobile. It’s still too early for me to tell how much I’ll like using the Note II, but I don’t see any reason why it couldn’t replace my usual pocket sketchbook. A few sketches from this past week. Up first is a rendition of a comedy duo that may play a part in a graphic novel I’m still noodling through. Each week after my improv class, I try to hunker down in the park and work on the story. Last week I finally gave my characters names. This week I gave them faces, based on a some old gents who walked by while I was in writing mode. I know I’m the type of person who will generally agonize excessively over things like character design and names, so I like the idea of just biting the bullet and getting on with more important things like story and character. 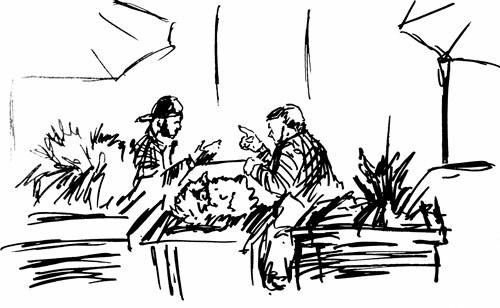 Above is a random slice of life; two rough-looking dudes in the Meatpacking district discussing business while waiting to be served their artisanal whatever at a fancy street level restaurant, from my vantage point on the High Line. 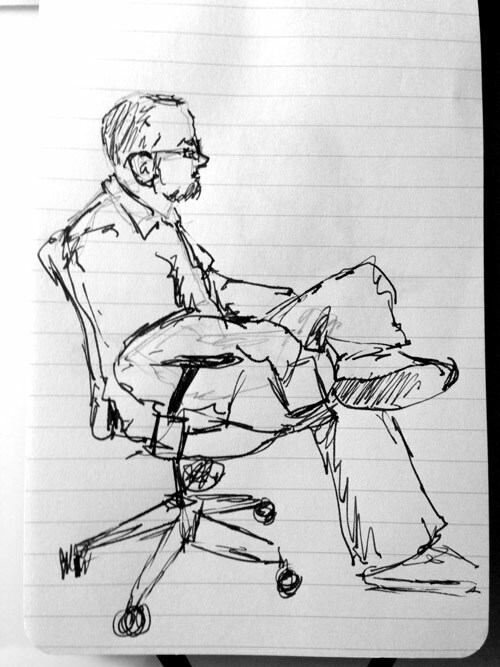 And finally: I brought a ruled notebook to a company meeting, and proceeded to use it solely for sketching my unassuming coworkers. This blog used to be littered with unnecessary self-portraits, but it’s been a while. And now that I’ve started to figure out pen nibs, I couldn’t resist scratching out my mangy beard. Actual sketches? 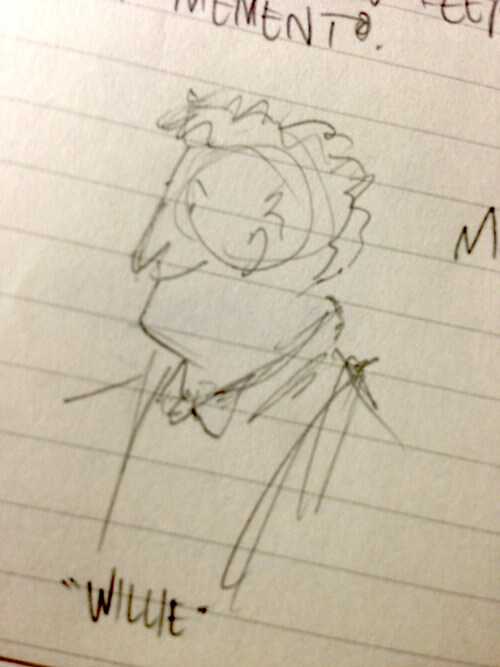 From Mark’s sketchbook? On Mark’s Sketchbook? Trippy. Goofy sisters drawn with the dip pen. 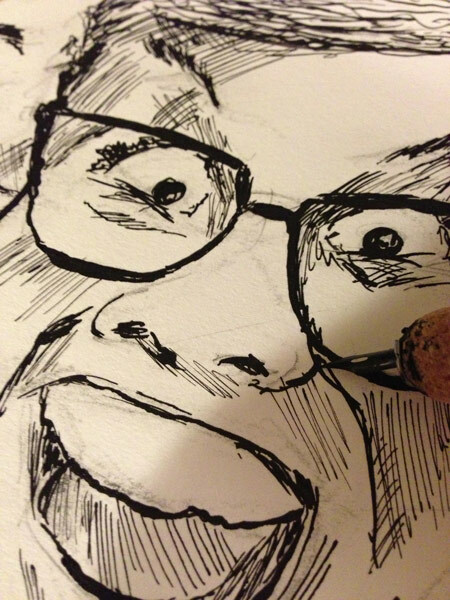 Drawn at a smaller scale than the last ink drawing. I’m excited–not because I’ve turned another pair of strangers o’ the week into bad caricatures–but because I did it entirely using a crowquill nib dipped in ink. I went a bit overboard on the hatching, but I blame that partly on the fun I was having just continuing to see what kind of marks I could make. But darned if it’s not the first time I’ve actually enjoyed working this way. With this batch of nibs, the ink seems to flow just right. It’s really easy to control the line width, but there’s also a bit of unpredictability that keeps even carefully constructed lines looking loose and sketchy. And maybe I just got lucky, but there was no ink splattered in over an hour of drawing.